Cedar Fair decided to theme its two new coasters for this year after the late NASCAR driver Dale Earnhardt. 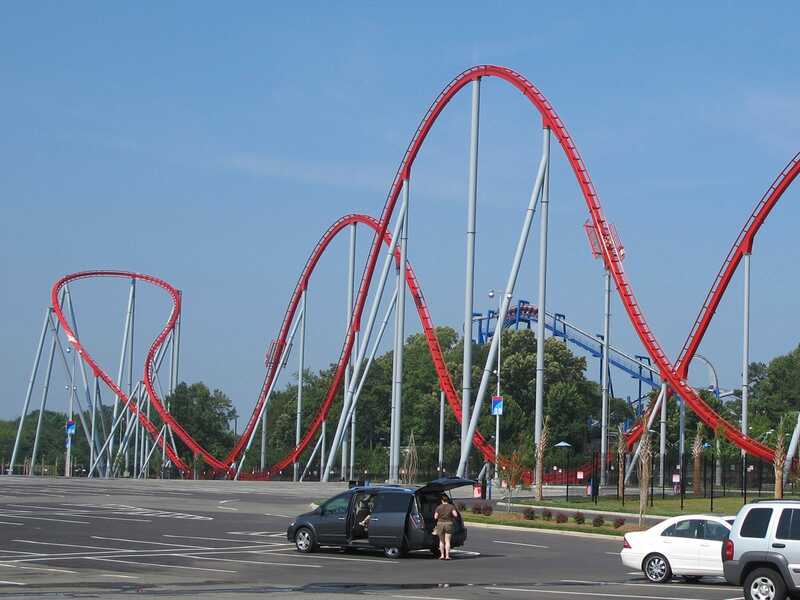 The version at Carowinds is the smaller of the two, but it's nevertheless a winner; Intimidator (#1501) is one of the smoothest rides to be engineered by Bolliger & Mabillard in some time, albeit with one caveat; the are no strong forces at all on the ride. The entire experience consists of gentle (but sustained) floating airtime. If you like that sort of thing (and I do) then you may find you've got a new top ten coaster. If you prefer something more lively then the other new coaster may be a better choice. The new ride makes for a dramatic addition to the park skyline which until recently was not really visible from the nearby interstate. Now, however, motorists travelling in both directions will find their eyes drawn to the massive structure, which will almost certainly result in increased attendance. This can only bode well for the future of this park. New since my last visit is a relocated coaster from the late Geauga Lake. The renamed Carolina Cobra is still a Vekoma Boomerang (with all that entails, both good and bad), but it has been refitted with a unique new restraint design that completely eliminates any of the head bashing which afflicts so many of these rides. Passengers are held in place with a soft padded vest which is basically the same as that found on flying coasters, and while it feels a little bit loose in places it is nevertheless far superior to the alternative. The park was absolutely jammed with school groups today, and as a result we elected not to queue for any other rides. Instead, we spent some time wandering around the park, taking in the various sights and sounds. It was particularly good to see shiny new paint on several of the coasters, some of which looked quite shabby on my last visit. With the addition of Intimidator this is a park that is going places; it'll be interesting to see what the next few years have in store.